Wednesday Wonderings takes place in St Mark’s on the last Wednesday of the month. 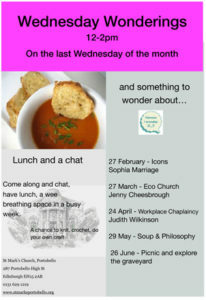 We meet at 12noon, eat a light lunch, usually soup, bread and cheese and chatter. Over coffee and cake, we ‘wonder’. This February, on Wednesday 27, we are ‘wondering’ about Icons. Sophia Marriage, our priest here at St Mark’s, recently painted an icon and she will be sharing her experience with us. Everybody is very welcome.